Resident Athlete Nico Megaludis (61 kg) earned a silver medal at the World Team Trials Challenge Tournament. Nico earned a win over Tyler Graff in the semifinals but dropped two matches in the best-of-three finals to Nahshon Garrett. Regional Training Center Coach Jake Varner (125 kg) was upset in the semifinals by former Minnesota National Champion Tony Nelson, but wrestled back with wins over Tanner Hall and Dom Bradley to earn the bronze. Resident Athlete Josh Rodriguez (57 kg) lost a 5-2 decision in the annual Beat the Streets dual meet in New York City. Josh faced U23 World Champion Reineri Andreeu Ortega of Cuba in the dual. Collegian Brady Berge (70 kg), wrestling under the NLWC banner, had a tremendous weekend and earned a spot on the 2018 U.S. Junior Freestyle World Team. Brady won three straight matches to win the challenge tournament and face Austin O'Connor in the final best-of-three series. 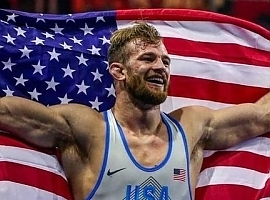 Brady won the first match, 7-4, lost by technical fall in the second match, and scored a 6-2 victory in the third match to win the World Team spot. Congratulations Brady!!! Nick Lee (65 kg) won three straight matches over top opponents to make the finals of the challenge tournament where he lost to Andrew Alirez. Jarod Verkleeren (65 kg) lost his first match, 2-2 criteria to Sammy Sasso. Jarod then won six straight matches to wrestle back and place third in the challenge tournament. In the match for the bronze, Jarod faced Sasso again and scored a 15-4 victory in the rematch. Congratulations to all of the NLWC Wrestlers on fine performances!